The error code: 35: Error decoding data received from the server. The hardware configuration of the computer has changed. This means that the hardware characteristics were changed. 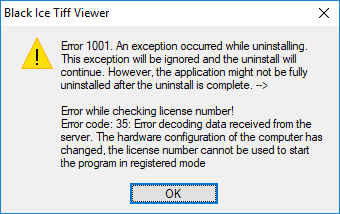 In order to resolve the error code 35 uninstallation problem, please use the FORCEU=1 parameter for Tiff Viewer MSI uninstallation. You can uninstall the Tiff Viewer (using SCCM) without the error message by using one of the following MSI command below.